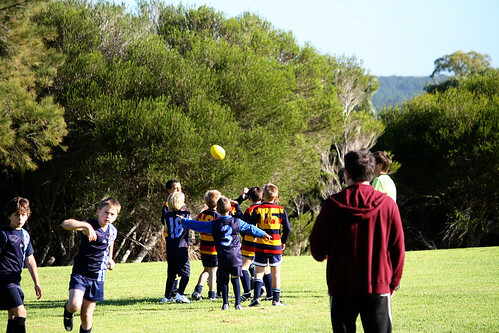 Last week we got up at the crack of dawn on a Saturday to be at a football oval at 8am. 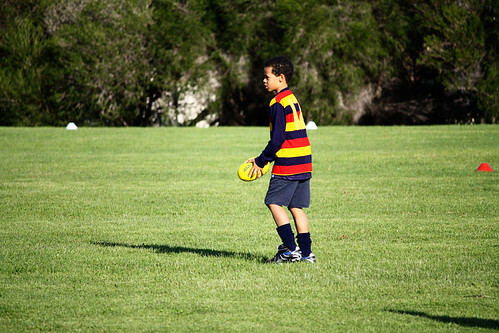 JJ and his team had their first game and he did pretty well – although I am biased! His team has way too many kids but luckily only a few kids from the other team turned up so the extras got to have a game anyway. Because there are so many of them on the team they’ve setup a roster system for games off. Even though JJ won’t be playing this Saturday he still wants to go and watch. At least it’s a local match this time and I may have risen from bed by 8.30. But last Saturday he enjoyed it and he even got to have a kick. You can see his head, one head above everyone else below. While he wasn’t gasbagging with one of his mates he did actually remember to try and get the ball. I think this game has brought him a new found confidence and a bit of attitude to go with it. He was doing a bit too much chatting and when I told him to watch out the ball was coming he informed me that I know nothing about the game and he knows what he’s doing. We were lucky that it was quite a good day, the sun was out and it got a bit warm. I know it won’t stay that way and I’ll have to dig my thermos cup out the cupboard so I can take a cup of warm tea to these games. For posterity, a team shot. I had the zoom lens on so it was hard to get a decent shot of them all without people being in the way. I am confused at the last shot – do they have 2 uniforms? And mum, of course you know nothing about football – watching it for 20 (ahem) odd years means nothing!! I think it is wonderful – phrases like “Even though JJ won’t be playing this Saturday he still wants to go and watch” and “While he wasn’t gasbagging with one of his mates” say so much about how happy he is to be involved in it. Jeanie, he played for the other team so wore the stripy top during the match. 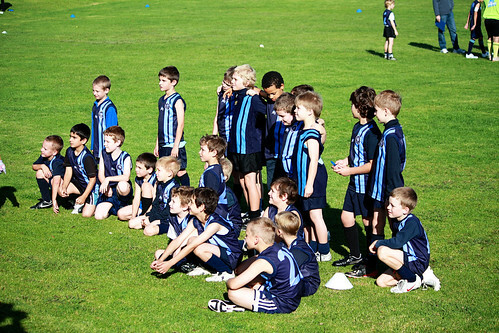 The blue tops (oops guernseys) are their normal uniforms. This is fantastic. My son plays his first game for his new team tommorrow. I think I am more excited than he is! It’s such a wonderful Saturday morning ritual as you can appreciate! Farmerswife – I’d love to know how it goes. JJ is rostered off tomorrow but the game’s local so we’ll still wander down and cheer the team on. Jen, my sons game was great. They won, but it doesn’t matter because it’s junior league and it’s all about fun! He got the ball a few times and did a great run up along the side line, and did some great tackles too. 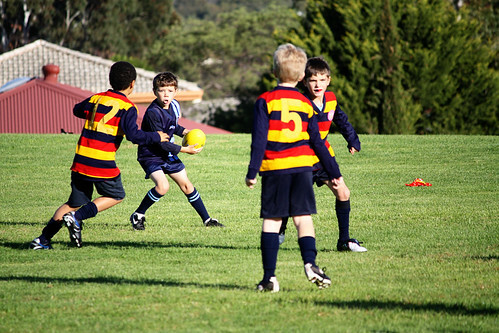 The thing that annoys me is that a couple of the kids don’t want to share the runs, so the quieter kids, like my son miss out because the coach just lets these boys do what they want. I hope that improves, but it was really fun to watch. I love seeing JJ out there playing football…he looks great! My gosh he looks so tall. I loved these times at my kids’ games Jen. I swear I was just as excited as they were. Enjoy every minute Jen.